Another bonus of Cathy and Chris visiting this weekend: they eat meat! I’ve been wanting to make this dish for a while, but a large portion of our friends are either vegetarian or only eat fish. This recipe comes from The Stinking Rose Restaurant Cookbook , and while it’s a bit time-consuming, the end result is well worth it. We served this with a big salad featuring cranberries, apples, and blue cheese. Yum! So, unfortunately, I left everyone’s ravioli in the water while I took the picture for the blog, so yours may be a little overcooked. This is like really delicious Chef Boyardee! Wow, I guess that confirms that yours were overcooked. This is another one that we’ll have to get the recipe for. Oooh… what makes it spicy? There’s curry and cayenne in the filling, and some red pepper flakes in the fumet. I really like it. In a saute pan, heat the canola oil over medium heat. Add the lamb and cook for 8-10 minutes, breaking up with a spoon, until browned. Remove from the heat and drain, reserving the juices for the fumet. In a small skillet, heat the olive oil over medium-low heat. Add the onion and garlic and cook for 5-7 minutes, until browned. Remove from the heat and let cool, then add into a food processor with the Parmesan, ricotta, bread, rosemary, curry powder, cayenne, salt, and pepper. Blend on medium-high speed until crumbly — you want the mixture to still have texture. Transfer to a bowl and add the lamb and mushrooms. Stir to combine. Flour a couple baking sheets and get the wonton wrappers ready. Place one tbsp of the filling in the center of each wrapper and cover with another wrapper. Moisten the edges with a fingertip dipped in water and crimp the edges firmly with the tines of a fork to seal. 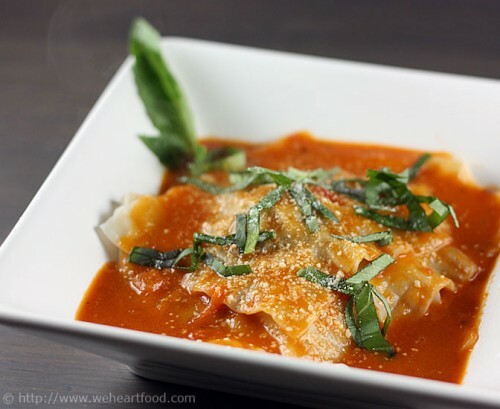 Place each ravioli on the baking sheet, then place the sheet in the freezer for at least 30 minutes before cooking. Meanwhile, make the fumet. In a saucepan, combine the reserved lamb juices, broth, tomatoes, and pepper flakes. Season with salt and pepper and bring to a boil. Reduce the heat to medium and cook until the broth is reduced by half, about 15 minutes. Add the butter and stir until it is completely melted. Bring a large pot of salted water to a boil. One by one, gently drop the ravioli in the water. Decrease the heat to medium and cook for 4-5 minutes, until the edges are tender and they float on the surface of the water. Gently drain and place into warmed soup bowls. Ladle the broth over the top and sprinkle with Parmesan and basil. This entry was posted on Sunday, January 18th, 2009 at 6:20 pm	and is filed under The Stinking Rose Cookbook. You can follow any responses to this entry through the RSS 2.0 feed. You can leave a response, or trackback from your own site. It looks elegant the way you served it. You bring back memories for me! I loved going to The Stinking Rose. This dish looks lovely! This used to be my favorite dish to order at the Stinking Rose, but I seem to recall the last time I passed by there it was no longer on the menu. Now I can make it myself! Thanks for sharing.